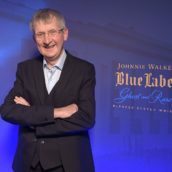 There are some things that are constant in this world – death, taxes, the revival of Big Brother for yet another year despite no-one admitting to watching it, my inability to write one word where I can shoe-horn in five of them; and the yearly Special Releases from drinks giant Diageo. With 28 distilleries (29 and a half if you include grain distilleries) in their back pocket they’ve got quite a range to choose from and each year they riffle through their casks to choose some special whiskies to release. The core talking points are almost always the now ever-present Port Ellen and Brora yearly releases, but sat around those two are a bunch of interesting bottlings giving a bit of a twist on house styles or coming from distilleries that don’t often get a lot of love. 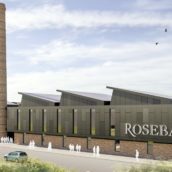 Rosebank 21yo – not that surprising, but the distillery closed in 1993 and this is reportedly some of the oldest spirit they have left. That’s a worry, as it’s from 1990 – how many more official Rosebanks will we see? Knockando 25yo – a first Special Releases entry for quietly respected Knockando, ignoring the usual distillery style of bourbon matured spirit and giving us old European oak first-fill sherry casks. It’s also a first in that it’s been cut to 43% – all previous Special Releases have been cask strength, if you don’t count 2007’s Royal Lochnagar Select Reserve (which Tim doesn’t…). Port Dundas 20yo – the first single grain release as part of the Special Releases and an interesting one. Matured for three years in refill casks (although I’m sure I was told first-fill casks on the night) before being switched to ex-sherry, new European oak and first fill bourbon for 17 years before vatting and bottling. Billy: A light buttery nose with lemons, vanilla, cinnamon and a hint of musty old socks. It was a powerful beast at 64% and quite closed, but water opened things up to lemon tinged wood, sweet apples, sherbert, stewed whole lemons (a gooey concentrated lemony flavour that’s a great base for a grown-up lemon cake – recipe available on request) and a wisp of smoke hiding underneath. Tim: A very nice nose, with shortbread, pollen, citrus, then some chocolate and coffee. Leafy and fresh. Even at 64% this is ridiculously easy to drink, very fruity: grapefruit and tinned peaches & apricots. The finish is incredibly moreish. With water, tinned pears and lemon sherberts. A lovely dram, definitely an improvement on last year’s 12yo, which I was slightly disappointed with. Billy: This was the one I was most interested in, being a sucker for aged grain whisky and Port Dundas in particular. It had a gluey nose with some milk chocolate and toffee which carried over into the body as more of a Galaxy Caramel flavour than Cadbury’s. It was quite oily with salted caramel, espresso and bitter orange peel, and a bitter finish with a hint of rubberiness and some menthol. Not really one for me, unfortunately. Ali: The nose is spirity, with polish and Christmas cake. Toasty fruit cake on the palate, sweet dates, then gets very nutty with roasted hazelnuts and walnuts. Nice sweet notes, also a menthol edge. Velvety-smooth finish. Billy: Big sweet peat that jumped straight up your nostrils and poked you in the forebrain, a touch of what Tim calls ‘Wet Dog’ (and which makes me question what sort of dogs he’s sniffed when wet) [I shared the back seat of a car with a wet West Highland terrier on many occasions in my childhood – Tim]; pungently lemony boiled sweets and some sweetly medicinal notes, reminding me of doctor’s surgeries in my youth. To taste, it wasn’t quite as sweet as the nose, with eucalyptus, red travel sweets left on the dashboard in the sun, and a hint of pilchard tins (brine, not tomato sauce). That wasn’t all that complicated but the finish made up for it, with a burst of sherbert and cough candy being followed by a slew of forest flavours: broken twigs, bark, pine needles, brown crunchy leaves; and behind all of that a hint of charcoal dust. Tim: A particularly expressive nose, with wet burnt wood and, yes, wet dog (not sure why Billy finds this so peculiar) [I grew up in a cat and bunny rabbit household. Our rabbit was called Stew, despite being a girl bunny… – Billy]. Seems paradoxically rich and quite youthful simultaneously. Faint menthol, liquorice, eucalyptus; buttered toast, fennel and phenols: soot, ash, bonfire. The palate is classic Lagavulin – a sweet hit, then gusts of smoke and ash billowing over the tastebuds, balanced by a light honey glaze. The finish is huge and bonfirey, plenty of woodsmoke. Hot and drying at full strength. With water: Tweed and eau de cologne on the nose, also some barley sugar and butterscotch. Very leafy, very well-balanced, but still big soot & ash. Billy: A big and flowery nose, which I didn’t expect (being a relative newcomer to Port Ellens), with Tom Thumb drops, some polished wood, green leaves and a dry, lightly smoky earthiness. 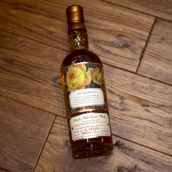 To taste the floral hit continued with added fruit – almost glazed fruit tarts – leading through a transition of vanilla into sour and muddy peat. It lingered long after with sweet green leaves, bitter chlorophyllic veg and a gentle fizz of crunchy Refreshers. Tim: Much richer than expected on the nose – not overly smoky at first. Very obvious that this is not going to be one of the more austere releases we’ve seen in this series. There’s oak notes in the background, but my initial impression was a delightful combination of honey and grassy, earthy leaf mulch. Gradually becomes more phenolic, with camphor, woodsmoke and a bandagey note creeping forward. Finally, a bonfire of dry smoke, burnt dry leaves. On the palate, an immediate phenolic hit, with an broad range of dry smoke, ash and rich wet peat, all with a lovely honeyed sweetness backing it up. Again, the flavours are very intense, the palate is fuller, richer and rounder than my memory of some of the previous official PE’s; this is a generous Port Ellen, showing a different facet of the distillery character to the sharp austerity we sometimes find with old PE. The finish is very long and warming. With water, it somehow gets even better – the smoke becomes a heavy wet peat with Frazzles and wet burnt wood, and now there’s some winter fruit as well (damsons, sloes). This is a fresh, vibrant, voluptuous PE, seeming quite youthful with the oak restrained in contrast to a few years ago when the official bottlings seemed to be getting a little tired. Comfortably the dram of the tasting for me – it’s great that Diageo still have some top-quality casks like this. Despite the return to form in 2009 and 2010 I reckon this to be the best official Port Ellen since the early years of the Special Releases. IMPORTANT NOTE: Please be advised that our (very small) allocation of this year’s Port Ellen was prebooked by customers before the beginning of September, so please don’t email us about it. We haven’t got any. 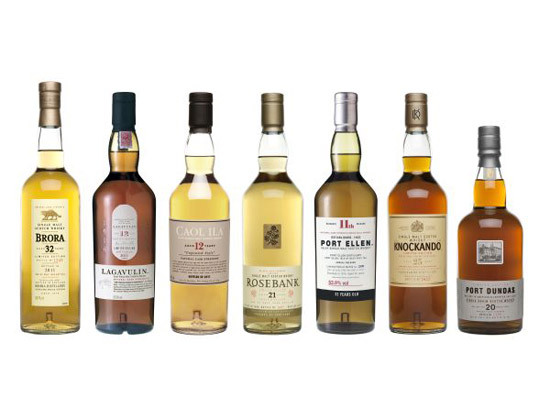 If you want any of next year’s PE (if there is one) please email our colleague michael[at]thewhiskyexchange.com next August – we’ll be compiling our pre-order list from then. Please note that sending an email doesn’t mean that you’ll definitely get a bottle, it just means that you’re on the list. Tim: Treacle and demerara sugar on the nose; then some heavy varnish and furniture polish. Develops some rubbery notes; very rich and syrupy. Unsubtle, and unintegrated: a bit clunky. The palate is somehow both sweet and beefy, with heavy brown sugar and Oxo cubes. Heavy concentrated raisin, walnut and date – there surely must be some PX sherry casks here, but they’ve overpowered Knockando’s light distillery character. The finish is drying, with the return of the rubberiness. I’m not really a fan of this style of whisky, and I think it’s a bit of a shame when a lesser-lauded distillery gets an airing in the Special Releases and disappoints like this. A missed opportunity. Tim: Ah, Rosebank so rarely disappoints (although official botttlings are pretty thin on the ground apart from 2007’s stylistically atypical over-priced but under-rated 25yo). The nose displays the classic fresh cut grass, hay and summer fruits I was hoping for, with some hints of apricot jam and a pleasant biscuity aroma like Jacob’s Fig Rolls. The palate is medium-weight, following closely to the nose but with a more honeyed emphasis. Very drinkable at full strength. Opinion in the room seemed to be split as to whether this was better with or without water – I thought it was best uncut, finding the oak turned a little cardboardy when I added a few drops of water. Nonetheless, at full strength this was a hugely enjoyable dram. Ali: Blossomy on the nose, almost Viognier-esque, with notes of peaches and lychee, very floral. Strong green peppercorn on the palate and a subtle smoke. Very moreish. Ali: Burnt wood, ash and smoke on the nose, with madeira cake and rice pudding skin. 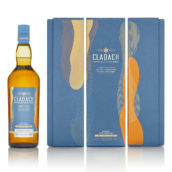 The palate is amazingly fresh, with spice and almonds, ginger, toffee, caramel and condensed milk – like a Caramac bar. Long with a velvet-smooth finish. Water brings out a candied orange citrussy note. Tim: Last year’s Brora 30yo was unquestionably the highlight of the 2010 Special Releases for me, a real return to form after a few iffy years. This 32yo, the oldest official Brora yet released, starts off on the nose with some lovely toffee biscuit aromas and the expected wet stones, farmyard aromas and classic candle wax, before developing more complexity in the glass – I found rosehip syrup, blackcurrant flower and some icing sugar and cakespice aromas, along with some pleasant tweedy oak. The palate was pretty big, with a surge of sweet fruit compote before the phenols finally arrived – a glowering, dry smokiness expanding rapidly on the tastebuds. The oak then threatened to dominate, getting a bit too tweedy and becoming a little too drying in the finish with the ashy smoke now very big. Another great dram, with the nose in particular being outstanding, but being hyper-picky I felt perhaps one or two slightly tired casks might have slipped through the net, knocking the balance off slightly. I have a very low tolerance for that, but no-one I else I heard complained of it, and in any event this was immensely drinkable all the same, a lovely Brora. 1) 90 minutes is not quite long enough to taste and make proper notes on seven whiskies, especially in a room full of noisy people – unless you stalk off by yourself and don’t talk to anyone. Half the room wasn’t even bothering to make notes, preferring to chat among themselves or network with the bigwigs, but for those of us whom you want to review your whiskies either a separate event or a slightly longer running time would be much appreciated. In the media presentation we got in September, the Brora was said to be 1404 bottles – turns out it was 1500. We won’t complain about that too much as it’s a very nice whisky. It looks sloppy, though. The Glenury Royal is supposedly 1404 bottles as well, but we don’t know yet if that’s right either as it wasn’t ready in time for its own coming out party . That’s tougher to understand. Worrying echoes of last year’s Bell’s Christmas decanter debacle. Another gripe about vintages: how come the years of the whiskies are revealed in the press release but not on the packaging for several of the drams? The Caol Ila and Lagavulin are both supposedly from 1999, but there’s no mention of that on the label. Ditto the Knockando, which was distilled in 1985, and the Brora, which is apparently 1978 – no mention of it anywhere on the bottle or box. But the Rosebank label does state clearly that it’s a 1990. Some consistency would be appreciated. Anyway, these minor whinges aside, congratulations to Diageo on a quality batch of whiskies for 2011. The PE in particular was a marvellous dram – shame it was already completely booked up before it even got here. As Tim said, the earlier 25yo Rosebank seemed overpriced when it was released (at £125), partly I guess because there were Rare Malts still available at lower prices. Four years on, the 25 and this new 21 are in the same price bracket. I’ll not ask you if you think the new one is overpriced, but if a customer could afford only one, which would you recommend? Thanks for sharing your first impressions. One could expect the press release to have been released after the whiskies have been bottled. I prefer the 21yo Rosebank to the 25, although they are very different whiskies. The 21yo is for me closer to the classic Rosebank style, but the 25yo is a very good whisky too. Hehe, well-known smell here too. I believe they call it musk. I can understand your choice. That Rosebank character will be a sad loss when stocks finally run out.